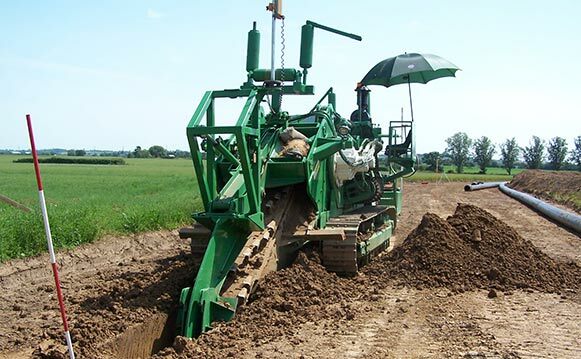 We can provide many different trenchers to excavate prior to the installation of services producing trench sizes from 200-1050mm wide and up to 2000mm deep. Many of our trenchers are capable of working directly into the highway saving the need to remove the road surface prior to the excavation of the trench. Two models of our trenchers also feature forward loading conveyors, this allows for spoil to be discharged straight into waiting lorries, removing the need to clear arisings using other machines, these machines also have the feature to place the spoil adjacent to the trench, removing the need for imported backfill if the material is suitable to be used to reinstate. The excavated material when the machines are used forms an ideal pipe bedding, saving the use of expensive pipe bedding and surround. Any of the fine material left as surplus after reinstatement on verge or field is easily spread and compacted minimising the amount needed to be removed from site and also reducing the risk of subsidence and shrinkage of the backfilled trench. 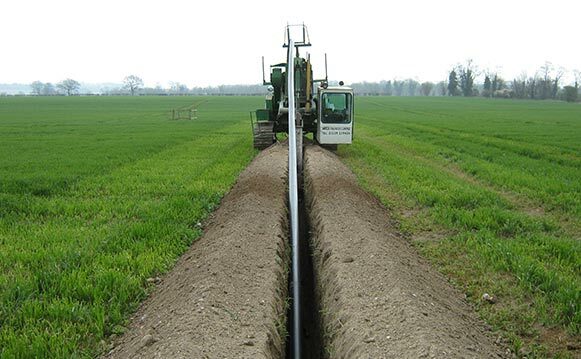 For trenches installed in agricultural land, our field trenchers are the ideal machine to allow for a high output trench excavation, ideally suited to water and gas main installation. The excavated material, again, makes ideal pipe surround and the fine crumb settles well in the trench reducing the likelihood of shrinkage and subsidence.